Two time National Champion and 3rd team All-American Mikal Bridges had quite the career at Villanova. He finished 2017-18 ranked #3 in the NCAA in Win Shares and #4 in Box Plus/Minus. Now, Bridges is projected as a late lottery selection in this year’s NBA draft, thanks in large part to his improvements in his three years at Nova. Bridges’s PNSP of 76.0 ranks 11th in this year’s class, and 1st among wings (meaning PNSP does not see any elite wings in this year’s draft – note Michael Porter Jr. does not qualify for our models since he only played 53 min). The Role Probability Models agree with the consensus opinion that Bridges is a safe, high-floor pick, giving him the 2nd highest starter probability in this year’s draft class (62%) & the 7th lowest Non-NBA probability (7%). Those projections also come with a weaker All-Star probability (12%), indicating a lower ceiling than most lottery picks. Let’s look at some common themes from his NBA projections. There are tons of reasons to believe Bridges will light it up from 3 in the NBA. Playing on one of the best college offenses ever, Bridges led Nova in minutes, FT%, 3PM, 3PA, and 3P%. He finished the year 18th in the NCAA in 3P%, shooting 43.5% on 239 attempts, including 38% on 152 NBA 3s (per Will Schreefer). Bridges’s height/length give him a high release point that allows him to easily shoot over the top of most guards/wings. Bridges also hit 85% of his free throws in 2017-18, another sign that he won’t have a problem shooting in the NBA. Our models project him as an above average (but not elite) NBA 3-point shooter in terms of both volume and accuracy. The fact that Bridges does not project off the charts here is reflecting the idea that he is unlikely to become a primary initiator at the NBA level, and is more likely to serve a complementary role where he won’t see the volume to become a truly elite scorer. So, what signs point to Bridges serving more of a complementary role in the NBA? And why does he have a low All-Star probability? 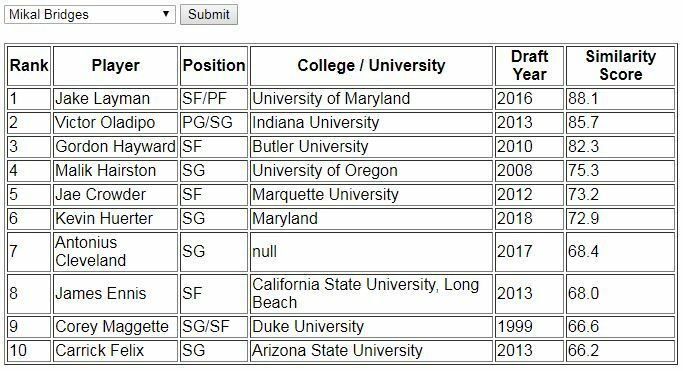 The two biggest factors that hurt Bridges’s projection to the NBA are his age (almost 22 years old) and his low high school recruiting rank (#96 RSCI). In general, models will penalize older players (based on evidence from historical data), however we still do see some older players develop into All-Stars (e.g., Draymond Green, Kawhi Leonard, Stephen Curry, Jimmy Butler). Although he was a highly efficient offensive player, he was not a high volume scorer or skilled shot creator and thus is probably not suited for a high-usage role. By our models, Bridges does not project as a high volume scorer at the next level. In fact, his best box score projection is actually assists where he projects to be elite relative to other wings. While this points to his high basketball IQ, it also points to him not serving a primary scoring role in the NBA. He was just an average rebounder in college, and projects as a below average rebounder for an NBA wing by our models. These concerns merely indicate that Bridges may struggle to become an elite NBA player/scorer – he can still become a very good NBA player. Bridges was an unselfish, team-oriented offensive player at Nova, where he showed the ability to cut to the basket and move well off the ball. He showed similar abilities on the defensive side of the ball, where his instincts and awareness were excellent. Bridges’s length and athleticism give him great positional versatility on defense. He has already shown that he can bring intensity on that side of the ball, and he should be able to guard 1-3 in the NBA, perhaps 1-4 if he can hold his own against NBA PFs. It is worth noting that he is still just 200 lbs and it remains to be seen how he will fare defending stronger NBA forwards. Bridges uses his length well for breaking up passing lanes and contesting shots, as reflected in his solid steal and block numbers in college. His career STL/40 (2.1) and BLK/40 (1.3) were consistent all three years of college. Bridges has a very high steal projection in the NBA by our models, which gives more confidence that he will continue to be a plus defender. His Defensive Box Plus/Minus did take a dip last year (down from 6.9 to 4.4) as his offensive role grew. If we are assuming he will take more of a back seat on offense in the NBA, he could really thrive on the defensive end and become an elite perimeter stopper. Bridges’s similarity scores are interesting in that there are not many historical players with a similar profile, as we see his most similar player at only 88.1 (most other players have a handful of similarity scores above 99.0). Perhaps his combination of production, length, and shooting are rare for his age? Albeit at lower scores, this list of players flashes a lot of the same styles we have already laid out for Bridges – long, versatile, two-way contributors who are plus 3-point shooters. Obviously, some players fitting that bill more so than others – namely, Victor Oladipo, Gordon Hayward, and Jae Crowder are all 34%+ career 3-point shooters who can guard multiple positions and have a 7-foot wingspan. Given his prototypical size/length at a valuable position, 3-point shooting ability, and defensive prowess, Bridges would serve as a great fit on most NBA rosters. Perhaps teams looking for a superstar or primary offensive initiator might look elsewhere, while more solidified teams would love to add him.